If you read yesterdays post you will know that Paul, daddy of two girls and owner of “When I was a kid” & ‘John Crane ltd’ are on a mission to uncover which of their toys are the most beneficial to a child, especially those on the autism spectrum or those with special needs. The idea is to make sure the toys are the best they can be and in a way that’s beneficial to all children, not just your “typical child” but also those who have developmental delays within a spectrum of areas, difficulties with sensory processing, occupational health, communication, etc. I also wrote how I was sent a large catalogue displaying the current John Crane ltd toy range, which was just huge, yet extremely pleasurable to look through. There were some great toys, making it quite difficult to select just six off the them to which I would provide some feed back on. Well, as you may have guessed already, they liked what I had to say and that’s why today I’m going to share some of that feed back I gave on one of their products with you guys. Who didn’t love “Picking Pairs” as a child? I know I did, my dad and I would play for hours with a pack of cards – all 52 of them laid out on the floor. Heaven knows how we memorised them and picked the pairs! One of our suppliers, John Crane toys has seen the fun of this traditional game and also the educational benefits too and come up with an up to date and colourful wooden version – called The Memory Game! Memory games help with all sorts of skills in younger children, even early reading skills are enhanced! I was instantly drawn to this impressive well made wooden game as soon as I saw it in the catalogue. I love educational toys especially those that benefit all children, while providing them with a fun activity in the process. As mentioned above, Memory is a game that has been played for many years and is normally done so with a few decks of playing cards. Well, this has the exact same concept as a game of pairs but instead its been transformed into a beautiful wooden game with insert-able brightly coloured cards that have images on either side providing lots of visual stimulation. Each card has a theme there’s animals, fruits, clothing, transport and more. The wooden board has two slots, one where cards are stored and the other for when in playing mode (where you slot your desired card) The pictures are then hidden with the help of the wooden lids. Playing time per game, depends on your child and the amount of players (I would recommend no more than two or your game may be over to quickly). If your used to the rule, “For every pair you find, you get another turn” I would recommend you don’t use this mode of play! Remember, playing with a deck of cards results in a larger number of pairs needing to be found, which is why “When I was a kid” have introduced the toy in its toddler section. Why I chose this game as one of my autism friendly six! Many Children with autism or aspergers syndrome have exceptional long-term memory, especially when it comes to the child’s particular “Special interest” which is often true for the child with Aspergers. This could be anything from names, dates, specific periods of time, facts about space, or like little man, “Bus numbers and destinations” However working memory (which is more commonly known as our short-term memory) can often be a weakness, which is why many children on the autism spectrum struggle to follow simple sets of instructions, especially if it involves doing things in sequence. Yes, its easy to become annoyed with a child when they seem to lack the basic skills required to follow basic sets of instructions, more so if the child is yet to gain a diagnosis. For me, it was the difficulty I had when trying to understand why my child was able to remember vast amounts of information that related to, “Buses” but couldn’t carry out the smallest of tasks, like sending him to brush his teeth or put on his shoes, having only just reached the top of the stairs he would have forgotten what it was he was meant to be doing? Working memory is a process that most of us engage in without even releasing it. An example would be your boss giving you a set of instructions on a project that needed completing. We listen, process and store the information we’ve been given! We may jot down notes later but still need to recall the information in our heads and do so in the appropriate order. If you’re a parent of a child on the autism spectrum, there is a pretty good chance that your child’s teacher has reported that your child has poor attention or refuses to listen to any instructions being given. This is an all too common assumption, when in actually fact the child is listening extremely hard but the amount of information being given in such a short time frame leads to the child’s confusion, they become muddled within their own heads simply because they didn’t have time to process the information. The above can then lead to a host of other difficulties for the child, like challenging behaviour and low self-esteem. The child could even be branded as naughty, another all to common scenario. It’s for reasons like those above, that children with autism work well with visuals. Its well documented how children on the autism spectrum are better at carrying out day-to-day task with the help of visual prompts. Maybe… think about it as a set of instructions you follow when putting together a flat pack! This is how the child uses visuals. The John Crane ‘Memory’ game is the perfect tool to aid this area of weakness. Children with autism will have great fun memorising where each picture is on the board, they will learn the skills of patience and turn taking as well as the concept of competition, all while improving they’re working memory. Little man loves this game, but has now studied all the cards over a few weeks and now beats me far to easy (see this is where his talents come into play as once he wants to store information over a longer period of time he will set about doing it and does so very well) what’s great though, he still wants to play everyday. At 11 years old his working memory is still poor but improving all the time. Speech and language therapy as well as certain games we play and task I engage him in, such as asking him to remember things on a shopping list, are just a number of things I believe has brought about these improvements. 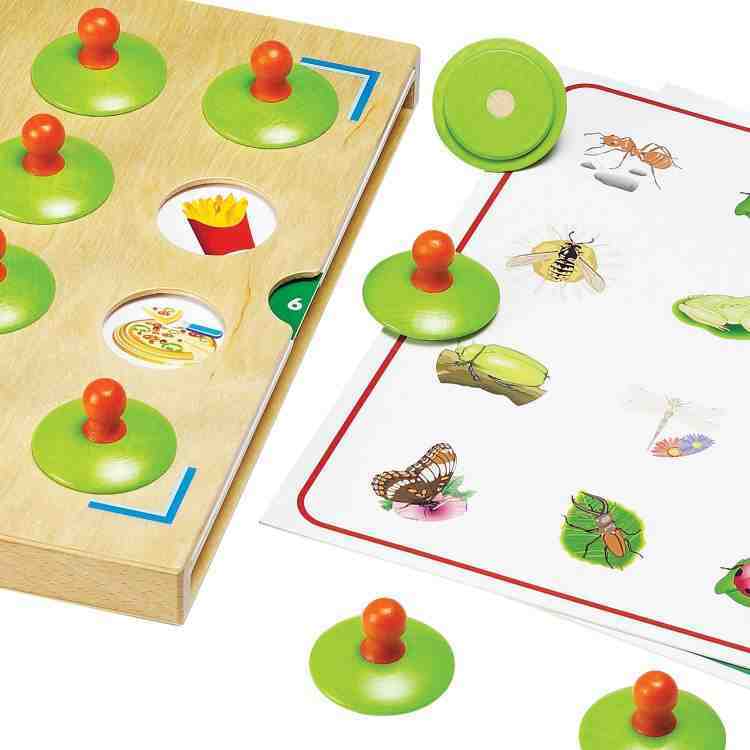 As much as Little loves this game, I would recommend to the younger child with and without autism, maybe a larger board with more pairs to match would be better suited to the older child. 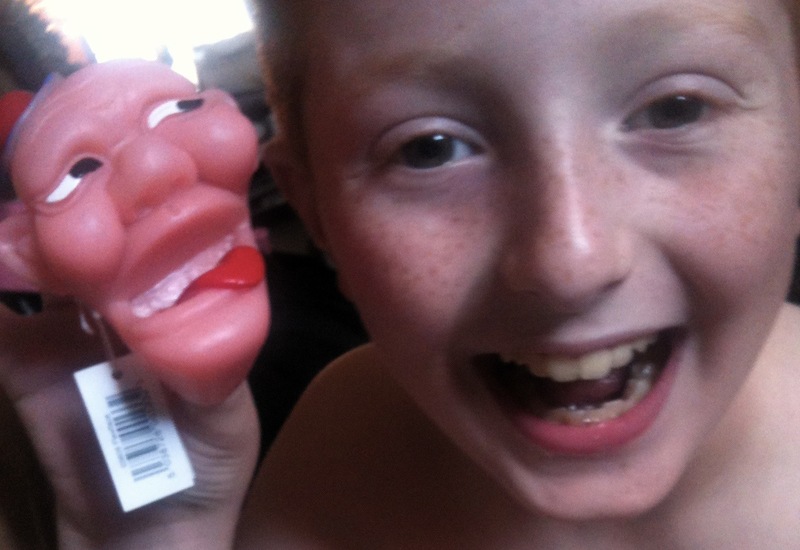 This is both a toy and a great resource for a child with special needs. It would be a great if ‘John Crane’ were to bring out additional packs of cards. These could then be sold in addition to the game, meaning parents could buy additional packs of cards as and when they like. This would therefore provide the child with more off a challenge, and they would never become bored, while also giving them that aspect of forming a collection (which they love to do). I consider ‘Memory’ to be a valuable resource & toy that could be used in the home, at school or nursery, even during a speech and language session! As always, ‘John Crane ltd’ have brought us a beautifully crafted wooden toy that is hand finished to perfection. This is a toy that I’m sure Paul is pleased to have featured on his site. Memory is likely to withstand the test of time and could be passed down generations with a little love and care. Whether it’s your child’s working memory you seek to improve, or just the chance to have fun playing with a fun but educational toy, then I can’t see where you could go wrong when buying Memory! Alice-Sara, shared her construction skills when reviewing the Meccano tool box for girls, back in August, Now it was the turn of the boys. Products we were sent: Space-Chaos & the Build and play mini case. 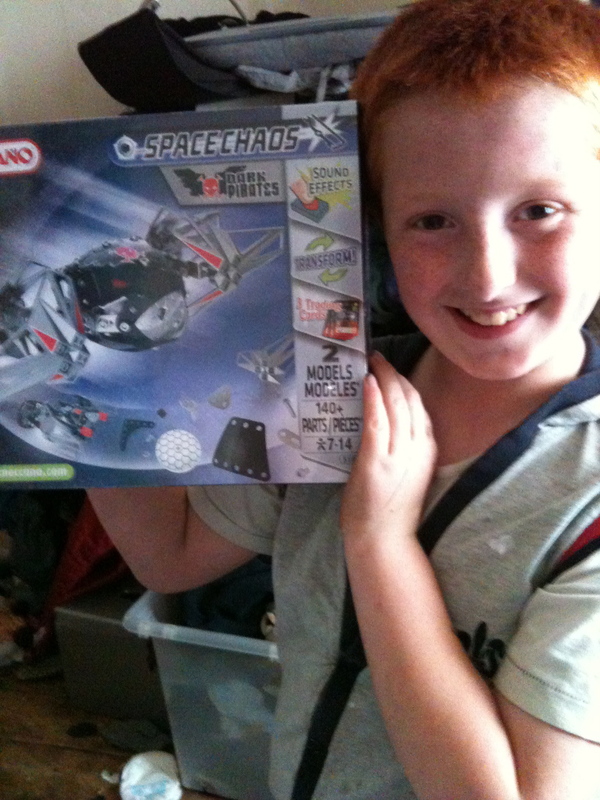 Space Chaos is designed for children 7-14 years (at almost 11yrs this was well within his age range). Before getting out the cash and splashing out, I suggest you find out if, (a) your child is a goodie (therefore the Silver force is what you should be aiming for) or (b) Your child is a baddies (therefore requiring a construction set from the Dark Pirates range). So, what’s the fuss about! Space Chaos is a collection of Air craft/space ships consisting of drones, raiders, bombers, fighters, destroyers and more! Each Set can make two models with a pack contents of around 140+ parts and pieces. The kit contains a special sound function that can be activated at the push of a button. Space Chaos Models come with a range of stickers to pimp out your ship, as-well as two trading cards showing the unique powers of each spaceship. Each trading card also displays a secret code, this can be entered online to access lots of extra goodies, including wallpapers, posters, cards, combat cards and plenty more. Before I go any further I wish to remind or inform the readers who don’t know, that little man has Aspergers and has associated difficulties with his Gross and fine-motor skills. His recent Occupational therapy assessment highlighted that he has a much greater difficulty with his use of fine motor skills, then we all thought and expected. With this in mind I wanted to see how he was able to cope with the Meccano set, or if it could actually help better his skills. I grabbed some drinks and on my return discovered he had open every single individual sealed bag which contained the many different parts and mixed them together as one! “Great, this wasn’t going to be easy” All the pieces in the set were a mix of both plastic and metal. The instructions looked simple enough, yet the pieces were mixed and I can’t even construct a kinda egg toy let alone this thing! Little man was getting nowhere, so after what seemed like days I finally managed to separate all the parts into their required piles. The bits where very fiddly for little man and he continually dropped them, he became angry refusing to try again. Little man has very low concentration, so, we did some sections over the course of a few days till day three when he spent time with his father, the model was finally completed. Little man doesn’t stick with something for long specially if it’s not bus or train related. Through with his fathers help he remained focused, Patient, and willing. To have completed the model into something that offered playability. This was a massive achievement. Difficult for children who experience difficulties with their fine motor skill. Now, this was Harley’s set and I’m not about to moan about the fact he didn’t have the first idea how to build this (apart from the construction of a wheel, which I’m sure happened by chance)! Why? Because at 21 months this set, that is recommend for 5-8 year olds is way to advanced and wasn’t going to happen. The idea was for Alice to carry out the honours and construct the set and once together, Harley would have a chunky car to text drive around the living room! I now jokingly call Alice Wendy from (Bob the builder) as she seems to have a skills when it comes to Meccano builds. The way in-which the pieces click together is the same as Alice-Sara’s own meccano set. She read the instructions with ease and being at the top of the recommend age range for this toy she experienced little if not any problems at all. The end result, Harley had a very nice buggy type car with beady eyes. I’m unsure if a 5yr old could construct this set as well as maybe a 7 or 8 year old. Little man also had ago at Harley’s set and despite his fine motor skill problems, he had no difficulties due to the easy click together action and the bigger more flexible pieces. 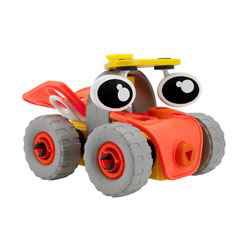 For this reason I would personally recommend the set designed for younger children, with the bigger easier to hold parts, if buying for a child with difficulties with their fine motor skills. (Just remove the label displaying the recommended age) little man would become very dishearten if he saw this. I Liked both products, but could see myself buying the latter (mini build and play) purely because of Little mans difficulty with the Space Chaos. I think the finished models of both sets look great! The build and play looked fantastically funky and cute, especially the big beady eyes. 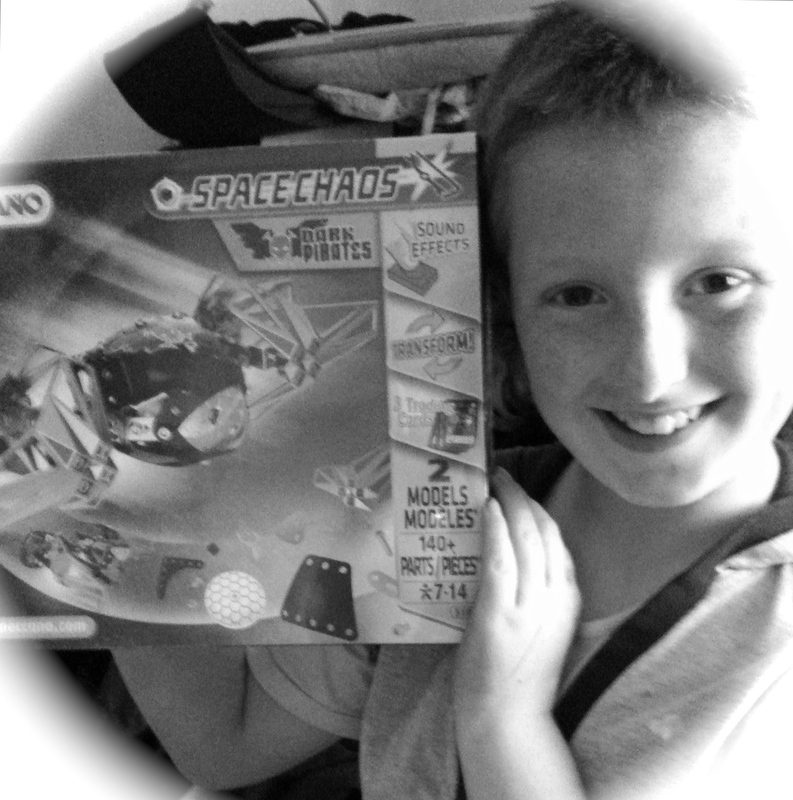 The Space Chaos had the added touch of the sound effects which Little man loved. I also love that the mini set comes in a click case allowing you to store the pieces away nicely, something sadly the Space Chaos lacked. This is it guys, it’s almost here, on September the 30th I’ll be of to the “Mad blog awards for the awards ceremony in London’s Soho. What makes this all the more exciting, is the fact that somebody likes the blog so much that they have agreed to sponsor me! These day’s it isn’t just footballers and big name brands that get sponsored, but bloggers too! When looking for a sponsor I wanted to find a brand or company that were passionate about what they do, in the same way I’m passionate about my family, raising awareness for autism and my love of writing and of course blogging. As well as this pretty huge requirement, I also wanted the companies brand/product to fit in with the overall theme of the blog. So, for me this would be a brand that deals with parents but with the added addition of autism. Well, I’m pleased to say, that I think I found this and a whole lot more in my sponsor. Yes, I’m both incredibly excited and delighted to be working with them! OptiBac are an independent family run business with a passion for Probiotics almost as big as my passion to create awareness for autism and help families dealing with diagnosis and the challenges it may bring. For those who have no idea what Probiotics are and how they relate to autism, let me explain! Probiotics are live microorganisms (more commonly known as friendly bacteria) and are something we all have, and need within our own bodies. This bacteria, alongside Pathogens, (Bad bacteria) can be found living in our intestines. It’s the good bacteria’s (Probiotics) that are needed to ensure good digestive health, while playing an important roll in keeping our immunity and energy levels high. It is important to have a good balance of both good and bad bacteria, and although we produce both, it is often the case that the balance needed becomes fragile. This is a common occurrence what with, Stress, ageing, travelling, high sugar levels and more, all being contributing factors. When our bodies experience an imbalance of the two, a person may experience symptoms, Such as, low energy, bloating, allergies & food intolerance, skin conditions such as eczema, heartburn, Diarrhoea, constipation, thrush, IBS and more. It is well documented within the autism world that the link between autism and digestive health is a pretty big One, with hundreds of thousands of children and adults with an autism spectrum diagnosis, having some type of ongoing digestive/Gut problem, that quite possibly requires some form of treatment, medication or diet requirement. I, myself have heard a mass of stories from other parents of children on spectrum speaking of their child’s poor and problematic digestive health. Just a few days back, a thread on my facebook page,“A boy with Aspergers” highlighted the high number of children with poor digestive health against a very minute few who have little or no issues, to be rather substantial. Though my own little study proves little, there has been a great deal of research involved in discovering if there really is a link between the two? Most results indicated that, yes there is! I have come across many parents and individuals who are trying to improve their child on the spectrums digestive health by changing the way they eat. If you are a parent to a child on the autism spectrum or you yourself are on that spectrum, its pretty likely that you have come across terms such as, lactose, gluten or casein! These naturally occurring proteins, can all be found within the foods we eat and children and adults with autism can be extremely sensitive to such ingredients (food intolerance) however it is thought that such occurrences could be due to the imbalance of probiotics and Pathogens (friendly and not so friendly bacteria). Most children with autism, already have a very limited diet and although there are plenty of Gluten-free and Casein-free foods now on the market, many parents experience a great deal of problems trying to introduce this to the child with ASD. Another important factor to remember, is the differing finds within scientific studies when it comes to eliminating these food groups and the true benefits for the child with autism. Little man is a child who has some degree of problems with his digestive health, mainly maintaining his regularity and the stomach cramps this causes him. His diet has improved over the years though not greatly! It lacks a lot of the healthy foods. His eating habits are quite limited and he therefore quite shamefully gets by on chicken or bacon. He also has a great fear of public toilets and certainly wont do a number two anywhere but when at home or when visiting one of his two grandmothers, which of course does nothing for his digestive system. So, of course I put these issues plus his terrible habit of wind breaking down to the above, but lately I’ve been forced to rethink, looking at the whole picture. You see, I don’t really know if little man has any food intolerance, though even if he did, the work needed to change his whole outlook on food would be a great challenge! So, if there is a possibility that a supplement of probiotics could help balance out his good and bad bacteria, I’m up for giving this a try! You see, it’s not just problems with the gut that children with autism experience, but also a mass of other problems, such as, behaviour problems, poor sleep, anxiety and more! Again little man suffers quite severely from all listed. Research into the probiotics has found that a daily dose of certain strains of probiotics given to a child with autism can dramatically improve areas of concern such as those listed above (especially poor behaviour and concentration levels). These guys are awesome, and yes, they know all there is to know about probiotics! They are in-fact the UK’s best selling probiotic range and are unique in the fact they use specific probiotics for specific health conditions, meaning there is a probiotic supplement right for each and every one of us. OptiBac Probiotics are so safe most can be used while pregnant, breast-feeding and some can even be given to children as young as 6 months old. With this and the fact OptiBac offers its customers affordable probiotics, aimed at each ones particular concerns, makes this a really trusting brand. Lactobacillus acidophilus Rosell-52 is one of the most commonly known probiotics and is actually used within five of the nine OptiBac supplements. The probiotic strain is often combined with prebiotics (prebiotics, is a source of food for probiotics to grow, multiply and survive in the gut) and is a good aid for health conditions such as IBS, reducing the risk of yeast infections and can even minimise the risk of diarrhoea, especially in travellers. Rosell-52 is used within the children’s range (from 6 months-12 years) This same supplement is also safe to take when pregnant or breast-feeding , so is therefore recommend to both children and expectant and breast-feeding mothers. (this is the supplement Alice-Sara and little H started today). The species ‘acidophilus’ can also be found within the premium range, such as, ‘Extra strength’ which consist of a further four strains of probiotic and contains 20 billion live probiotic microorganisms per capsule. This is the species we have started little man on this morning, which is given in the form of a capsule! Little man is used to these as he takes Melatonin to help aid his sleep at night, so, he had no problems taking it! There are many other strains of Probiotics that OptiBac use in their products and with each strain a different dosage helping to combat a persons health concerns in the most natural and healthy way possible . The above example is just one of many strains and more detailed information can be found over at the OptiBac website within its resource centre, You will also find a full list of the probiotics on offer and what each can do to benefit your health. You will find that most if not all, probiotics are approved for use, if you are a vegetarian or on a gluten or Yeast- free diet. They all contain no added sugar, (Sugar can actually counteract the benefits of the added friendly bacteria, which is while Probiotic yogurts are not really recommend, due to the added sweeteners and sugars) lastly they are free from artificial colouring. Other products that look great are, ‘Flat stomach’ and ‘For those on antibiotics’ (That’s the actual name of the product) which is a fantastic supplement designed to replace the bacteria’s that antibiotics kill, causing symptoms such as trash (it’s happen to me and I only wish I had known about Optibac)! This is just one of the many side affects that can result from taking a dose of antibiotics. So, there you have it. The brilliant OptiBac are my Mad blog awards sponsor and will be so kindly putting me up in a lovely hotel on the night of the awards. Make sure you all look out for updates, to discover how the probiotics are working for little man! Will there be improvement in his digestive health, sleep, behaviour, or very poor concentration? Let’s just wait and see. Please show some Love and like OptiBac on ‘Facebook‘ or follow them on ‘twitter‘. Also don’t forget to check out the OptiBac ‘website‘ Just pop on over to any one of these and say hi. I would really appreciate it and I bet they would too! The guys at OptiBac, have one of their very own Naturopath’s visiting a number of London stores and are inviting you along for some free health advice and special offers. Check out the site for locations. NOTE: We are not after a cure, we love Little man the way he is. OptiBac nor myself are claiming such nonsense. I’m just pointing out that yes, children with autism do tend to have digestive/gut problems and Probiotics may help improve this and maybe some of the difficulties listed above. If you’re looking for a cure, then I’m afraid you wont find one in probiotics or any other source for that matter! Some children with autism and SPD love the sensation they get from certain tactile experiences. Little man can is very tactile defensive, but also seeks out certain textures. He is a child who becomes very anxious and one who likes to fidget. When Little man broke up from school at the end of term (autism special school) his teacher gave him a gift called a squishy mesh ball. The ball is very sensory friendly, filled with a goo like substance, the ball is covered in netting and when squeezed the ball pushes though the netting and appears all bubbly. Little man loved it! Just over a month later I was sent a link to a website so that I could check out some products to review. The site is owned by a well known retailer called ‘Hawkin’s Bazaar’ I was overjoyed at what I discovered! So many of the products just throw themselves at me. These are toys at silly prices that many children with autism, SPD (sensory processing disorder) & ADHD would not only love but greatly benefit from. 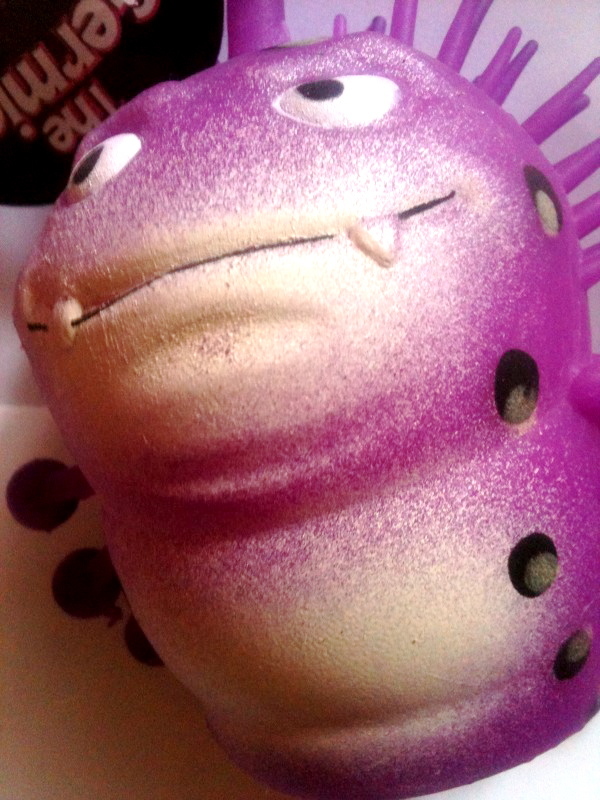 I even came across that Little squishy mesh ball, little man loves so much at the bargain price of £2.50. Little terrors, The Germies and Flexiface can all be found on their website under the category labelled, ‘Stress’ Here’s my opinion on why these are great for children on the spectrum! 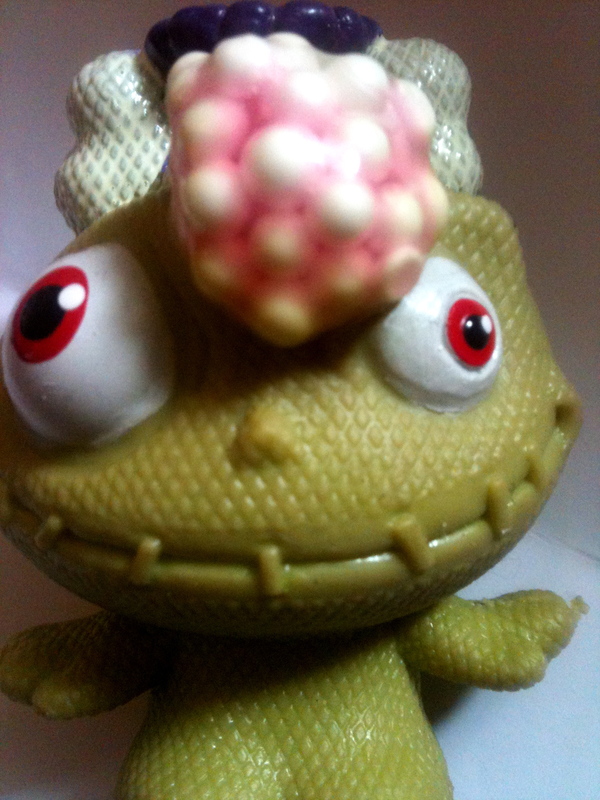 Both Little Terrors and The Germies are toys that have been designed to offer some kind of comfort as a stress reliever. It is said that such items are beneficial because when held and squeezed it helps to naturally clam the person/child down, removing the stress, giving them something else to concentrate on. The Child with autism get this same comfort when feeling anxious, stressed and upset. It also provides the child with some degree of sensory stimulation. It can be used to redirect certain other behaviours such as hand flapping while also working as a fidget for the child who feels the need to constantly use their hands. Just by holding one of these the child maybe able to concentrate on school work, or remain clam in a challenging, stressful situation. Another fun thing about the Little Terrors and The Germies that make them really appealing to children, are their design. Both are designed to resemble little monsters if you like, and when squeezed both give a great sensation and visual experience. The Little terror felt as if it was filled with sand, however once sqeezed you could see it was filled with lots of little balls. If you sqeezed slowly, you could then carefully remove your hand and the balls would stay in place making it look like monster brains (if you know what I mean) well if you don’t just check out the picture below! Little mans favourite the Fexiface can be used for all the above and so much more. 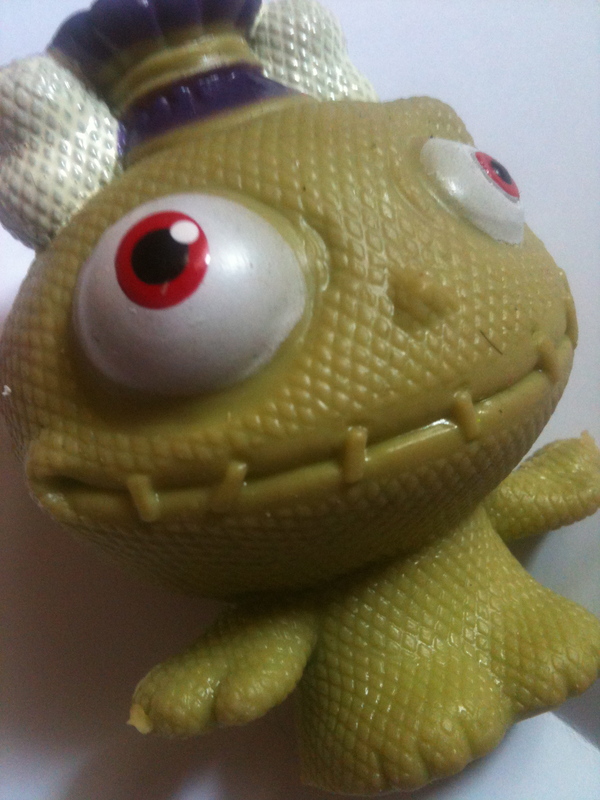 This is a toy that I remember as a child. My mother brought me a Fexiface some twenty-one years ago or more when I was around eight. I remember it well, it was during a day trip to Margate, we brought it from a joke shop. The Fexiface has three little holes on the opposite side which you insert you fingers into. You can then move your fingers about which causes the fexiface to change facial expression. 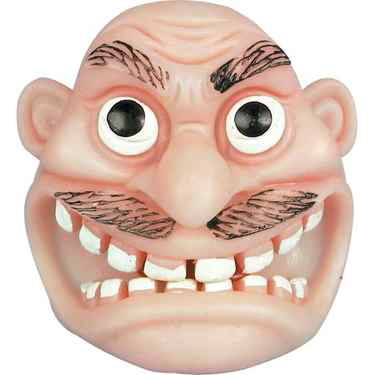 For such a small price this is a toy that can potentially help your child learn how to better understand facial expression. Though I’m sure Fexiface was never created for such a purpose as this, it sure does a great job at it. Myself and little man played a game where I would ask him to change the fexiface facial expression to a display a face that was happy, angry, sad, etc. We had brilliant fun and for me it brought back some lovely childhood memories. 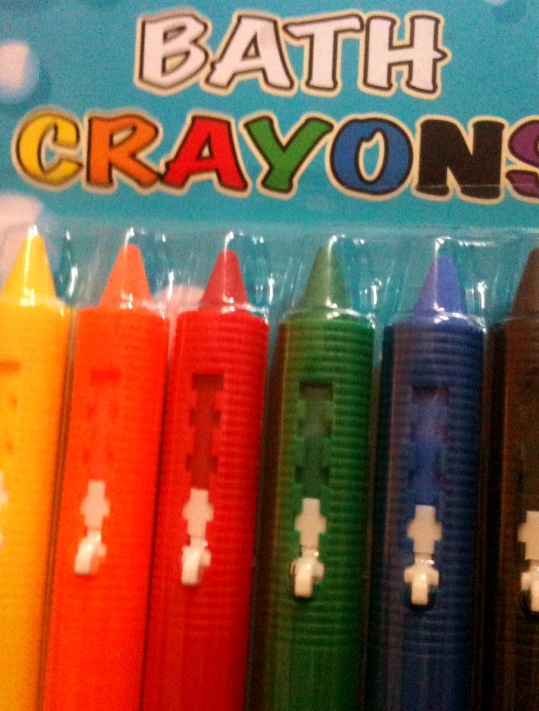 Bath Crayons are excellent. These are great for the creative child. They come out really well and we used them on the bath room tiles. All three of the children had fun drawing on the bath room tiles while actually being allowed to do so. Little man hates sitting in the tub. Again this is for sensory reasons, he would rather stand and wash under a power shower, sitting in the bath makes his skin wrinkle which upsets him. The Croyons are a great distraction and in a way helped him to relax. The other great thing about Bath Crayons is the fact you can use them as a visual aid. If your child uses symbols to help them sequence things, like a bath routine these are perfect. You can easy draw the symbols on the tiles, allowing your child to wipe off or even cross out each action they have carried out. A great alternative to using magnetic or Velcro visuals as despite them being made to be waterproof, the stream and condensation from the bath will eventually have an impact on this type of product. We had great fun testing all the products and would highly recommend these toys as sensory products as they offer this feature and so much more. So, why not check out Hawkin’s Bazaar online or visit your newest store where you will find the above and more. Note some toys/gadgets aimed at adults only.